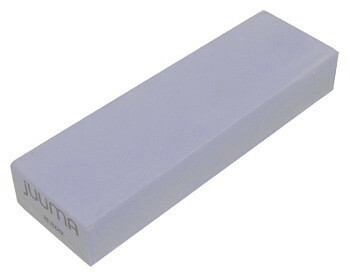 The Juuma whetstones offer a simplified sharpening system with the highest possible quality in the grit sizes on offer. Of the three stones offered, for the most part you will need only two. Choose either the 800 grit or 1200 grit stone depending on the normal condition of your chisels or knives before sharpening. If you are among those who tend to wait rather long before sharpening, it’s best to take the 800 grit stone to start with. But if you tend to sharpen early and often, then the 1200 grit stone is the better choice. A first pass on the stone with the 800 or 1200 grit, then go on to the 2000 grit stone for a finer edge and to hone away the scratches left by the first stone. If you don’t really like using finer stones, a 6000 grit, for instance, because of a lack of experience and practice, (learning to sharpen well is mostly a question of practice and time) you will be fine with the edge you obtain with the 2000 grit Juuma stone. If you like, you can later progress to the wide range of finer-grit stones that we offer from many quality manufacturers. Why Cobalt Blue? Juuma Cobalt Blue stones are made of aluminum oxide and a bonding material. They add a little cobalt to the stones to reduce wear and dishing, and to increase the sharpening speed. You’ll notice this especially if you’re sharpening tools edged with blue paper steel, an alloy often found on Japanese edge tools. The stone simply cuts much better. Cobalt gives the stone its blue colour. The stones are made up of a mixture of aluminum oxide, cobalt and bonding material with 3% water content to achieve a consistency that matches the press characteristics. 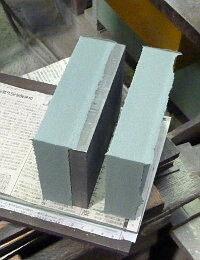 The mixture is compacted into a mould with a force of 80 tons. This is a fairly long and labour-intensive operation, as this method yields only one stone at a time. The photo on the left shows the massive steel mould. 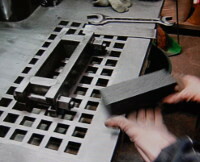 After pressing, the raw stone is removed from the mold and moved on to a special oven. The stone is baked in the oven for 8 hours at 200 °C to remove all the water added to the original mixture. This step is important – the stone must be completely dry to prevent it breaking or cracking during the firing stage. The completely dry stone is placed in a firing kiln and baked at 1260 °C for 36 hours. The bonding material undergoes a vitrification process (glazing) which inhibits any interference with the sharpening particles. The finished stone is finally left to cool down slowly. These stones are manufactured in Japan exclusively for Fine Tools. A short aside: in fact we wanted to start offering these stones in the summer of 2013. 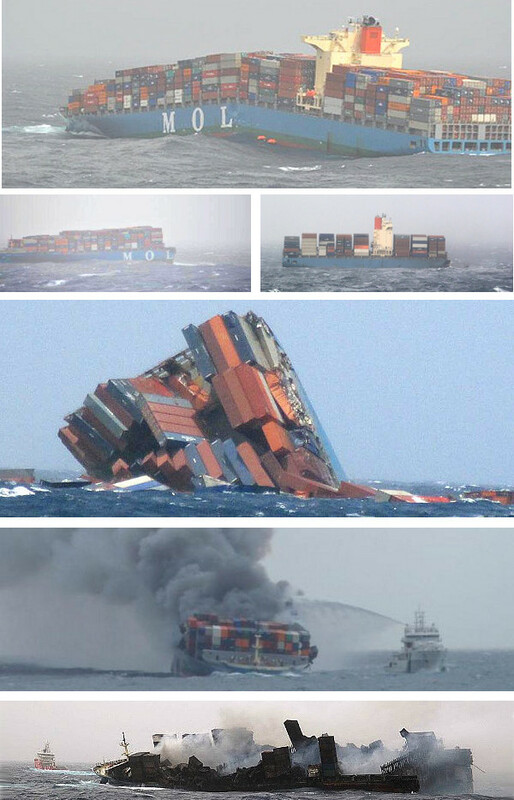 But the first production run is now resting 4000 metres down on the bottom of the Indian Ocean, along with, sad to relate, a shipment of very fine Japanese natural stones, because the container ship broke up and sank. The ship’s crew was luckily rescued. The whole shipment has now been stored underwater for a very long time, but this is not the recommended method for routine handling. 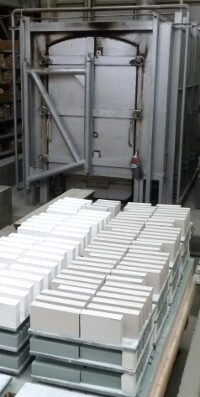 The stones must be stored in a dry place and placed in water just a couple of minutes before they are put to work. Advice for using the stones the first time: like all Japanese water stones, these stones should be flattened before use – that is to say the face should be flat over its entire surface. The cheapest and simplest method is to rub two water stones together; this works even if the two stones have different grit grades. A better way is to use a diamond stone or a flattening block. You’ll find a huge amount of information on this topic and on sharpening in general on the Internet. For its grit grade, this stone leaves a clearly superior abrasive pattern on the steel. For many applications this is the finishing stone that you really need. But more experienced and demanding users we recommend to continue with a finer stone, say 8000 grit, from our product line-up.